In many ways, the technological future is upon us, but do we really know what it will look like? Designer, author, and educator Carla Diana is working at the intersection of industrial and interaction design to explore the impact of future technologies through hands-on experiments in product and interaction design. “Whereas designers typically use form, color, and materials to make an object express some human element…we’re entering a time when sound, light, and movement are equally important parts of the creative palette,” she notes in her seminal article Talking, Walking Objects which appeared on the cover of The New York Times Sunday Review in January 2013. 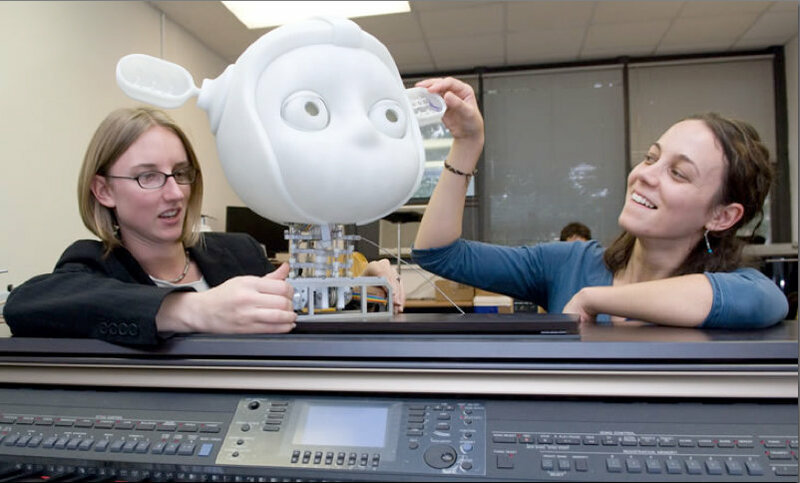 Emphasizing the need for designers to take stock of the emotional value of robotics as much as any other product attribute, Diana’s research aims to uncover new ways of making our everyday objects come to life. Diana was recently appointed to create the 4D Design program at the Cranbrook Academy of Art, which will open its doors to the first class of students this Fall. Steeped in Cranbrook’s history of experimental design, “the department explores the myriad ways that the physical world around us has become infused with an undercurrent of flowing data, turning everyday experiences into connected, feedback-driven interactions that are transforming every aspect of culture and society,” according to their website. 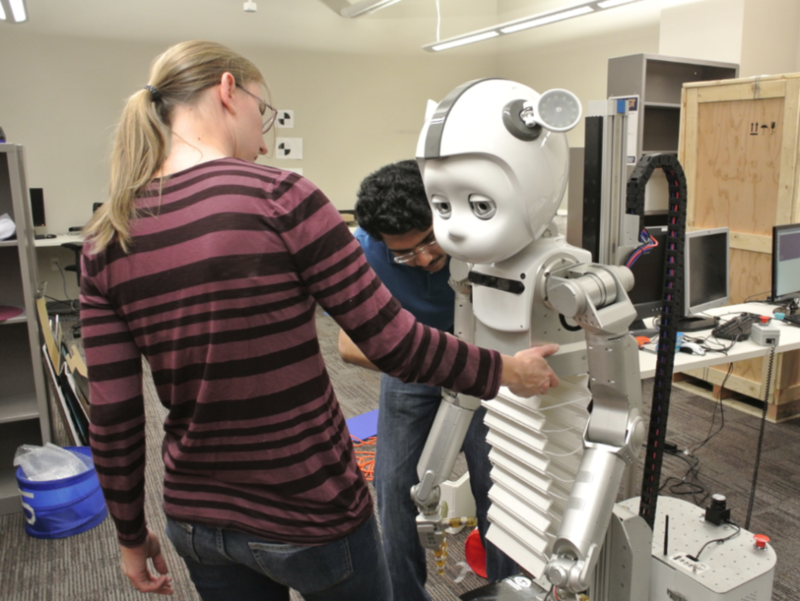 Diana writes and lectures frequently on the social impact of robotics and emerging technology. She spoke at the first Core77 conference back in 2014, right after publishing LEO the Maker Prince, the world’s first children’s book on 3D printing. She currently cohosts the Robopsych Podcast, a biweekly discussion of design and human-robot interaction, and is coauthor of a forthcoming book on smart object design to be published by Harvard Business Review Press. I have always been passionate about making the physical world around us interactive in some way. In my studio, I specialize in creative design for social robots. Earlier in my career, at Smart Design, I led very interdisciplinary teams that developed interactive products such as home appliances, medical equipment, and robotic vacuums. It was a thrill to bring together experts in engineering, industrial design, communication design and strategy to work on a product concept, and it also felt like these types of projects demanded a new kind of discipline that didn’t exist yet. When I branched out on my own with my studio, I also decided to take what I’d learned and create courses that synthesized all the seemingly disparate skills that need to come together to work on these kinds of products including storytelling, coding, projected images and displays, electronics prototyping and robotics. I launched the Smart Objects course at SVA, which has always been jointly run by the Interaction Design and Products of Design programs, and I also brought this course and others to UPenn and Parsons. The 4D Design department at Cranbrook is a chance to expand the philosophy of those courses into an entire program. 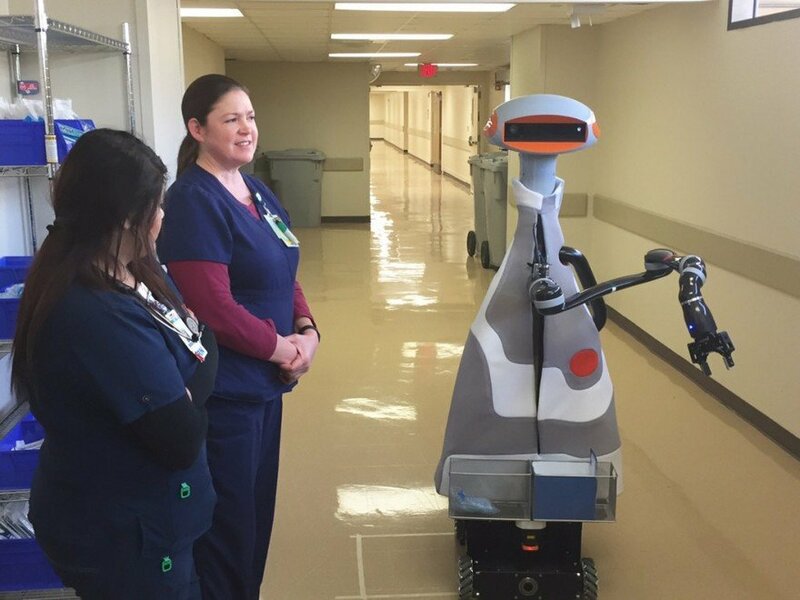 Diana’s studio led the design of Moxi, a healthcare service robot developed by Diligent Robotics to autonomously complete tasks in hospital environments, allowing nurses to focus on patient care. The key difference between 4D Design at Cranbrook and most programs in Product Design is our focus on interactivity and the creative application of technology. And we’re different from most Interaction Design programs in that our projects will be based on object qualities, taking a holistic view of form, light, sound, and motion; many interaction programs have more of a focus on screen and app-based solutions whereas we will emphasize prototyping in the physical world. We will embrace applied robotics but are quite different from robotics programs in that we are at the epicenter of art and design, with a studio-based model. We will place value on the overall concept of projects, looking at how well they relate to the context in which they operate, placing high importance on societal and cultural relevance. We will also be highly influenced by the other departments at Cranbrook such as Sculpture, Metalsmithing, Ceramics, and Fiber. For example, a student wishing to explore interactive textiles and wearable computing can draw on Cranbrook’s rich history in textiles, going back to Loja Saarinen’s historical design work. And a key difference between Cranbrook and most other programs is that we have no traditional classes, so instead of everyone having to meet preset benchmarks that may lose relevance over time, they will set individual goals based on their own career trajectories, diving deeper into the particular tools and methods that apply to their work rather than trying to cover everything in that short two year period. 4D Design Catalysts are internationally recognized experts in the area of design and/or technology who will have an ongoing relationship with the program. They will work directly with students through lectures and workshops in active engagements that will take a variety of forms such as charrette challenges with specific design prompts, one-on-one critiques, studio tours, and targeted research projects. I’ll be continually curating a list of Catalysts to represent a spectrum of current ideas and contribute to the collective voice of the program. So far we have folks like Rob Walker, who will do a workshop with students to coach them on developing a point of view, and Bruce Sterling who will share his cyberpunk wisdom. Brendan Dawes has already come through campus to set the tone with his playful and experimental work in data expression. Joshua Walton is a Cranbrook alum and expert in augmented, virtual and mixed reality and works with James Tichenor to provide groundbreaking workshops. We’ve also got Nervous System to inspire us with their pioneering work in algorithmic form and digital fabrication. The innovation firms Tomorrow Lab and Jared Ficklin from Argo Design will provide a glimpse of product design solutions and business savvy. Emilie Baltz will encourage us to explore ways to engage the senses, and Zach Lieberman will look at poetic computation. We also have Matt Jones on board who has been part of many seminal experiments in tangible interaction and is now part of Google AI. You’ve had a lot of experience designing and researching robotics. How did you originally get interested in robotics? I think it all started when I was in high school and took part in a summer program that was run by a professor at NYU’s Courant Institute. His name was Henry Mullish, and he was awarded a grant to teach computer programming to tenth graders. We started by learning how to encode punch cards and worked our way up to learning the syntax for five different computer languages, along with complex techniques such as sorting algorithms. I spent six weeks of that summer in a windowless basement surrounded by geeky kids like me and I loved every minute of it. Since then, I always loved the magic of code, but I was also driven to make things. It was during my time in the 3D Design program at Cranbrook (yes, I’m an alumna!) that a light bulb went off in my mind as I realized that the physical and digital would soon become intertwined and decided to focus my career on exploring that vision. The aim with Simon’s shell design was to strike a balance between machine/appliance-like aesthetics and friendly, human-like characteristics. The robot also needed to appear youthful, suggesting a creature that is in a mode of continuous learning and observation. 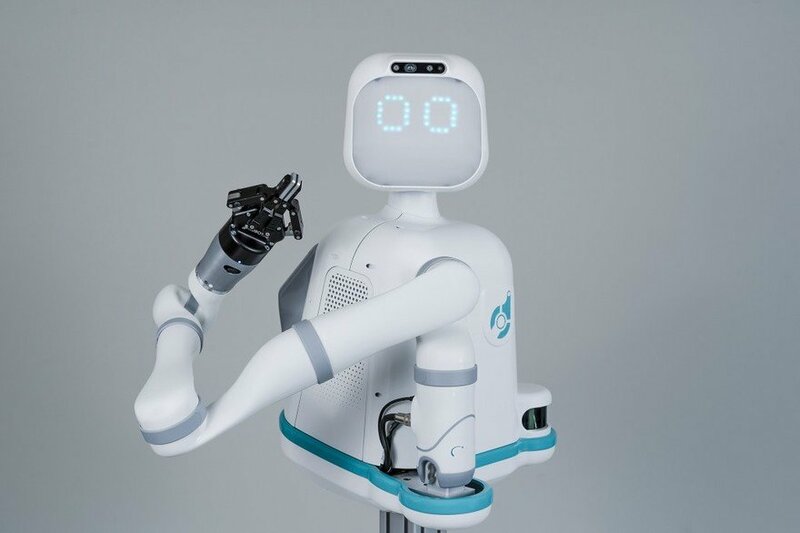 The second evolution of Simon is Curi, named after Marie Curie and a reference to the word “curious.” It has more refined facial features and, unlike the stationary Simon, Curi is mounted on a mobile platform. I think one of our hangups in this regard is the fascination with making things literally mimic human behaviors, like text and speech. Instead, we can glean a lot about meaningful product design by exploring abstraction and striving for more poetic expressions of messages through light, sound, and motion. We have a tendency to be burdened by the history of devices, so it’s hard to break us away from the devices we’re accustomed to, like the mouse and the keyboard. For example, the Amazon Echo has some lovely nuances, like the light that indicates the direction of the person it’s currently listening to. But then it can go even further, like letting us understand and control when it’s actively listening. Right now it’s more like a spy that doesn’t truly let us know what it’s up to. This is a topic that I’m squarely focused on right now as I’m co-writing a book with design research expert Dr. Wendy Ju on the social aspects product design for Harvard Business Review Press. 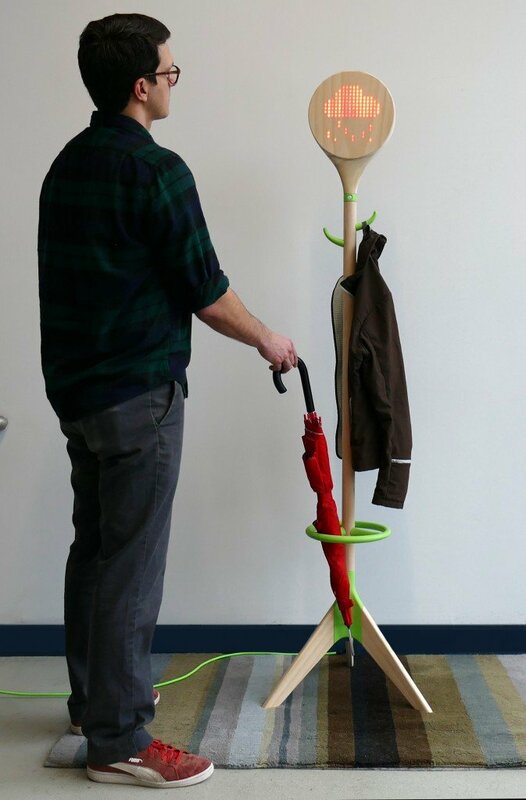 When users approach the Smart Coat Rack, it greets them current and upcoming temperatures as well as conditions such as rain, wind, and snow so users know what they’ll need to face the day. A circular rack at its base balances the form with a space to keep umbrellas. We noticed a lot of “companion robots” at CES—relatively simple objects that respond in cute ways and make you feel good. These sorts of robots seem effective, even helpful. Houskeeper robots, automatic breadmakers, laundry folding machines are large, complex, expensive, and seem to be WAY over engineered responses to ‘problems’ that ultimately don’t work well. What is the sweet spot for robotics right now, and in the next few years? I think the sweet spot will be in distilling robotic behaviors to only those behaviors that are meaningful in relation to the time and place they’re in. The Clever Coat Rack project is about this. It’s made of wood, with embedded electronics. It has a full internet connection but instead of offering Twitter feeds and email alerts it just gives you the information you need at that moment when you’re walking out the door: the current temperature, the day’s high and low, and significant upcoming weather conditions. It offers what’s needed to make a split-second decision about which coat to grab and whether or not you need an umbrella, but doesn’t burden the moment with other interactions or decisions. Some of the new Amazon housewares are starting to point that way, as well as products like the Jaxjox Smart Kettlebell that can track activity and offer relevant connected content. The Casper Glow lamp, for example, is a lovely product that captures the poetry and simplicity that I’m talking about, being designed with a focus on helping sleep through subtle changes in the glow it emits. It can be programmed as well as networked with other lamps. It’s not trying to be a lamp for every purpose—all design decisions were in service to the sleep context.